Fobbit 'fa-bit, noun. Definition: A U.S. soldier stationed at a Forward Operating Base who avoids combat by remaining at the base, esp. during Operation Iraqi Freedom (2003-2011). 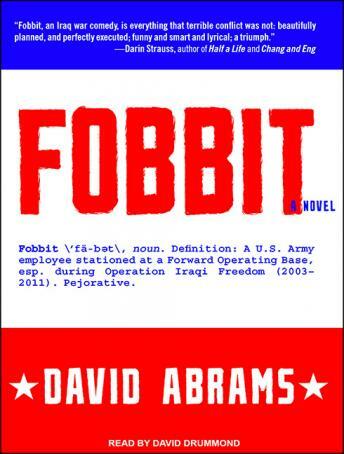 Pejorative.In the satirical tradition of Catch-22 and M*A*S*H, Fobbit takes us into the chaotic world of Baghdad's Forward Operating Base Triumph. The Forward Operating base, or FOB, is like the back-office of the battlefield-where people eat and sleep, and where a lot of soldiers have what looks suspiciously like an office job. Male and female soldiers are trying to find an empty Porta Potty in which to get acquainted, grunts are playing Xbox and watching NASCAR between missions, and a lot of the senior staff are more concerned about getting to the chow hall in time for the Friday night all-you-can-eat seafood special than worrying about little things like military strategy.Darkly humorous and based on the author's own experiences in Iraq, Fobbit is a fantastic debut that shows us a behind-the-scenes portrait of the real Iraq war.